Colossians 1:9-12 - For this reason, since the day we heard about you, we have not stopped praying for you. We continually ask God to fill you with the knowledge of his will through all the wisdom and understanding that the Spirit gives, so that you may live a life worthy of the Lord and please him in every way: bearing fruit in every good work, growing in the knowledge of God, being strengthened with all power according to his glorious might so that you may have great endurance and patience, and giving joyful thanks to the Father, who has qualified you to share in the inheritance of his holy people in the kingdom of light. How can you live a life worthy of the Lord, and PLEASE Him in every way? In other words, how can you make God happy? First of all, the ultimate way to please Him is by accepting Christ as your Savior, trusting in Him to forgive your sins by the work He did on the cross. But, what about after that? 1. By bearing fruit through good works. God created each of us to use our gifts and talents for good. Think about what YOU are good at. Are you good at singing, writing, sewing, baking, woodworking, or mechanics? Do you like to encourage others with your words, be a good listener, or just sit and hold someone's hand? Make a decision to use the gifts you have been given to bring a blessing to others. Ephesians 2:10 - For we are God's handiwork, created in Christ Jesus to do good works, which God prepared in advance for us to do. 2. By growing in the knowledge of God. Are you spending time reading or listening to God’s Word, learning what it has to say and how it can be applied to your life? 2 Peter 3:18 - But grow in the grace and knowledge of our Lord and Savior Jesus Christ. To him be glory both now and forever! Amen. Psalm 46:1 - God is our refuge and strength, an ever-present help in trouble. 4. By joyfully giving thanks to God in all things. Are you giving thanks in ALL things? You don’t have to be happy about what you are going through, but you can be joyful when you realize the trials you are facing are being used to develop your character and are helping you grow closer to the Lord. All things work together for good. Romans 8:28 - And we know that in all things God works for the good of those who love him, who have been called according to his purpose. James 1:2-4 - Consider it pure joy, my brothers and sisters, whenever you face trials of many kinds, because you know that the testing of your faith produces perseverance. Let perseverance finish its work so that you may be mature and complete, not lacking anything. 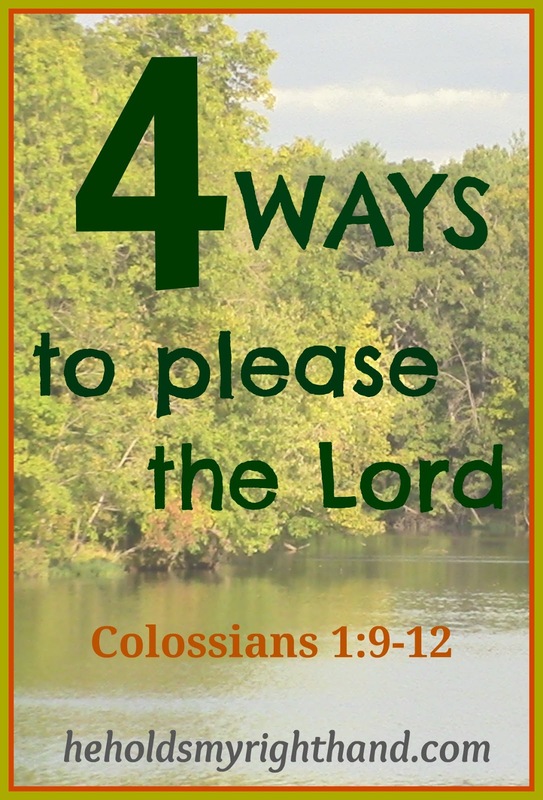 So, here's some food for thought: Are you pleasing God by doing these four things? Are you doing good works? Are you studying His Word? Are you allowing Him to give you strength? Are you joyfully giving thanks in all things? If not, why? We all have room for improvement, so take some time today to consider what you might need to do to set these four ways in motion.